Quaker Steak & Lube Grand Rapids will host the First Annual Winter Fest Run/Walk on Saturday, January 21. The race will begin on The Lube's patio at 11 a.m. and finish at 6 p.m. Runners and walkers will participate to support service men and women. All proceeds will be donated to Project Red, White and Blue. All ages are encouraged to participate. Registration is $15. Forms are available at Quaker Steak & Lube, Zaggers or Boondox. Collect pledges from family and friends. For each lap completed, pledges will be multiplied. Runners and walkers must wear shorts, but hats, mittens, socks and boots are allowed. Men are encouraged to go shirtless; women must wear at least a bikini top and at most a sleeveless shirt. Hot tubs will be provided by Zagger's Pool and Spa following the event. The Lube will grill food for runners and walkers throughout the day. For more information, visit Quaker Steak & Lube's Facebook page. 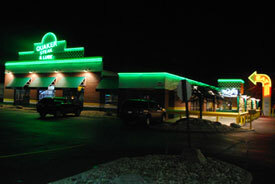 Quaker Steak & Lube restaurant is located at 4515 28th Street SE in Kentwood, Michigan.